We at Dwight Hall believe in collaborating with similar organizations at different universities throughout the country. While our structures may be more or less similar, we share the same underlying values and commitment to community service and social justice. Through regular communication, we hope to achieve better solutions to the institutional and operational challenges that face us all. 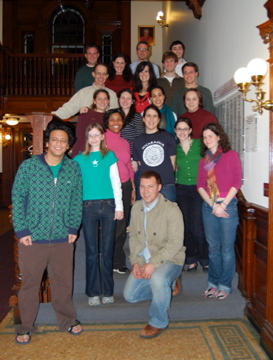 In March of 2008, five representatives from Dwight Hall travelled to Cambridge for an evening of productive dialogue with our peers from Phillips Brooks House Association (PBHA) at Harvard and Madison House at University of Virginia. A photo from the event, generously hosted by PBHA, is included to the right.